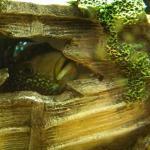 I introduced two fire gobies into my reef aquarium. I did this by floating the bag in the water to accommodate for temperature (30 mins). I then added a cup of water from the aquarium (15 mins), then another (15 mins). I then netted them and added them to the tank and finished it off by adding a dose of Stress Coat. The fish seemed okay and ate a little, however I noticed that the red blenny sort of had a go at one of them. They have since moved off onto a small hole together and haven't moved much. They come out only when some brine shrimp float by. I also moved a small amount of rock, but I just shuffled it in the same area. It has been three days and they are still hiding. I am concerned that they are intending on staying there and will eventually die of either stress or hunger. Should I be concerned? Is there any tips I could get? Is there anything I should do to remedy this? I was thinking of pulling all the rock out and re-arranging all the rock completely to remove any territories... ? The tank also has a pair of oscelaris clowns but they seem blissfully ignorant to the goby's presence. Help save the Great Barrier Reef! Get involved in reef conservation! 1) Quarantine all new arivals!! 2) when putting them in the display, use some sort of barrier to keep them away from the older fish, I used to use a Lee's Critter Keeper. The old fish could see them and work out their aggression without actually being able to damage the new fish. After a few days in there, let them out into the display and usually no issues. I will second the method Kevin suggests. A lot of people say you should rearrange your rockwork to fix territory issues but IMO this is a very bad thing to do for the general stability and balance of the reef. Okay so you recommend putting them into one of those isolation nets for perhaps a week? They will be close to the lights... will that effect them? I didn't use a net, but a plastic critter keeper with a lid with slots in it for water movvement, and I sunk it to the bottom. I wouldn't recommend keeping anything that close to the surface in an open topped container, it will be very easy for it to jump out. It appears as though they are just trying to get used to the aquarium. They are now starting to come out and enjoy the rest of the tank, however the blenny still eyes them off every so often.